My wife got this doll for Christmas in 1959, 1960 or 1961. It has absolutely no markings that we can find either on body or on clothes. My wife thinks it was likely purchased via the Sears Roebuck catalog at the time. It appears to be a Patty Playpal or Saucy Walker knock-off. 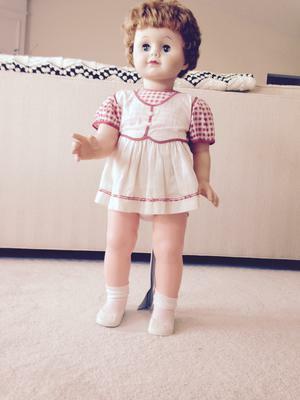 We would love to know the doll's name and manufacturer. Of course, if anyone knows what it might be worth, all the better! Thanks for any help that anyone can offer! Thank you both for your comments. It seems like you're right...it must be a Wendy Walker. Thanks again. Saucy walker dolls were made by Ideal marked Ideal Dolls W16 or Ideal Dolls W22. Could be a Wendy Walker doll.